I would do the happy dance, but I am too tired. The kiln is done! Well, sort of. The door blocks are cast, and it will take them a few weeks (!) to dry, and then they will need to be fired ever-so-slowly; but as far as work, there is nothing left for me to do. That feels really weird. I keep thinking I should be doing something, but there's no work to be done. Sure, I could tweak a few things. The stack could be a foot higher, and it could use an angle iron frame; but those aren't things that really need doing before the first bisque. I will be posting an entry about the process of casting the blocks soon. That was the only part for which I had never even been present when someone else was doing it, during my prior kiln-building experiences, so I was flying blind but I think I got it sorted out okay. (We'll see. If I didn't, I'll show you that, too.) And thanks to a site called Lulu, I am publishing a book about this project. But mostly I will be spending the three-week drying time making pots to fill this kiln. Not today, though. Today I am gallery-sitting, and resting on my laurels. Laurels decay rapidly, but they sure are comfy while they last. Cheers! Thanks for tagging along. It's hard to see what's going on in this photo, so I will clarify: I tacked a string with a small weight (a "plummet") tied to the end from the rafter of the roof over the kiln. The purpose is to make sure that the stack goes up straight, as over 30-plus courses of brick, a slight list can turn into a giant, unstable one. As you can see, the 2 courses above the standard come in slightly; fortunately we hung the plumb line before it got any taller. Such simple technology; but nothing better has yet been invented. Though the exact function it was made for is unknown, the little stone being used as the plummet has a small groove carved around the narrow end, making it perfect to tie a string around. That groove was carved over 3000 years ago. The rock was found on the Sebastacook River, a remnant of the people who lived there before Europeans came to this contintent. We've already brought this item to the attention of the archaologist at the Maine State Museum. who deemed it authentic but not particularly unique or interesting, which is why we still have it; but it pleases me to use it to plumb my stack, and imagine somebody millenia ago used it to make straight lines as well. Sorry. Castable is my boom! It won't last. 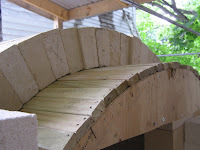 I started to apply the insulating layer to the arch today. I decided to mix and apply it one five-gallon bucket at at time, because bashing up soft brick is killing my neck and back, and I just can't do all that I need without interruption. 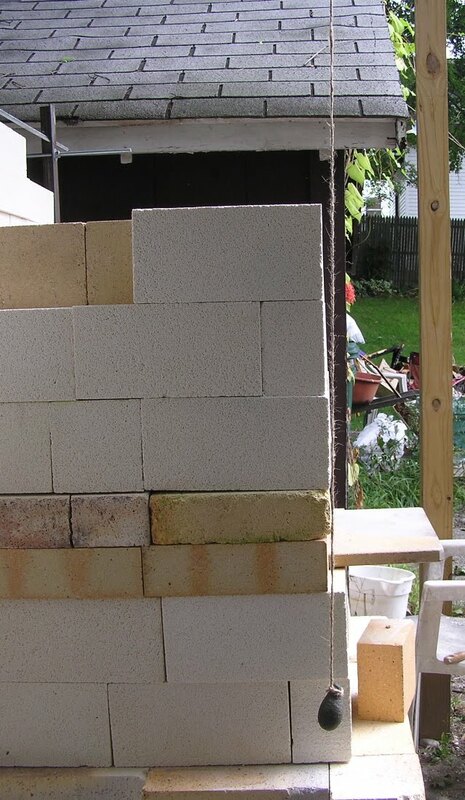 I started out intending for the crushed softbrick particles to be about the size of coarse grog, but quickly settled for a gravel-sized bits instead, when I saw how dreary and, eventually, painful the task of crushing brick was going to be. They only sell Portland Cement in 94-lb bags. 94 pounds!! Come on. While there are lots of people who can easily lift 94 pounds, there are lots more who can't. I can lift 94 pounds, but, ya know -- I don't want to. I'm going to grunt, and stumble, and possibly lose my grip on the bag, and have to heave it to get it in place, and my back will hurt the next day. Whoever decided that 94 pounds is the optimal package weight in which to sell portland cement was obviously not thinking of women, but not just that -- there are lots of men who would have trouble, too. The entire lot was only $9, which I suppose is great if you need lots and lots of it, but really, who needs that much? I mean, besides almost everybody who buys portland cement. But what about all those -- I don't know -- hobby masons? They must get stuck with loads of extra cement. Me, I would have gladly paid $9 for 40 pounds of it, which I can easily lift. And now I am going to have to figure out what to do with the leftover. Which is going to mean lifting most of it, as I only need a few pounds. Oh, and I am sure you already know this, but portland cement and concrete (which is conveniently sold in bags weighing as little as 25 pounds) are not the same thing. Concrete has little rocks and other crap in it, which we don't want, as we are going to add our own little rocks and other crap in the form of crushed brick and Hawthorn Bond. Cement is also not to be confused with plaster of paris, but that is a story for another day. Anyway. I mixed up a five-gallon bucket using parts-by-volume, 12 pts crushed brick, 7 pts Hawthorn Bond, I pt Portland Cement, 2 pts water. 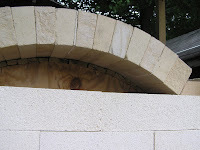 I applied it with a trowel to the west side of the arch, and will finish tomorrow. I certianly hope I am doing this right, as it is a sort of leap of faith -- if I've got it wrong, I'll probably eff up the work I've been doing for months now. Either way, I'll let you know. 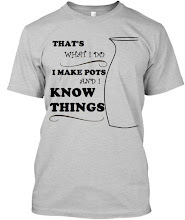 Warning: this entry will likely be hideously boring to non-potters. My apologies. Sometimes I note things here so I know where to find them! Several words, actually. Turns out to be a more complicated subject than I thought, and very little information is available on the web about castables. It's worth noting that two of the three potters I consulted recommended commercial castable, specifically mizzou, if it is to be used for anything structural, like, say, casting the arch itself. 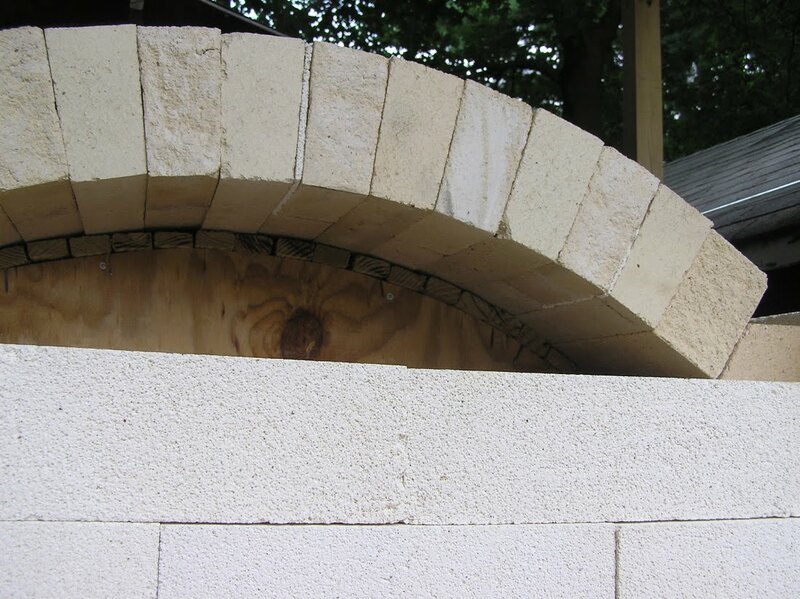 I was able to score four (or four and a half, depending on how you look at it) recipes for insulating castable, such as you would use to put over a brick arch, to slow heat loss. I was quite surprised by how widely differing the recipes are. 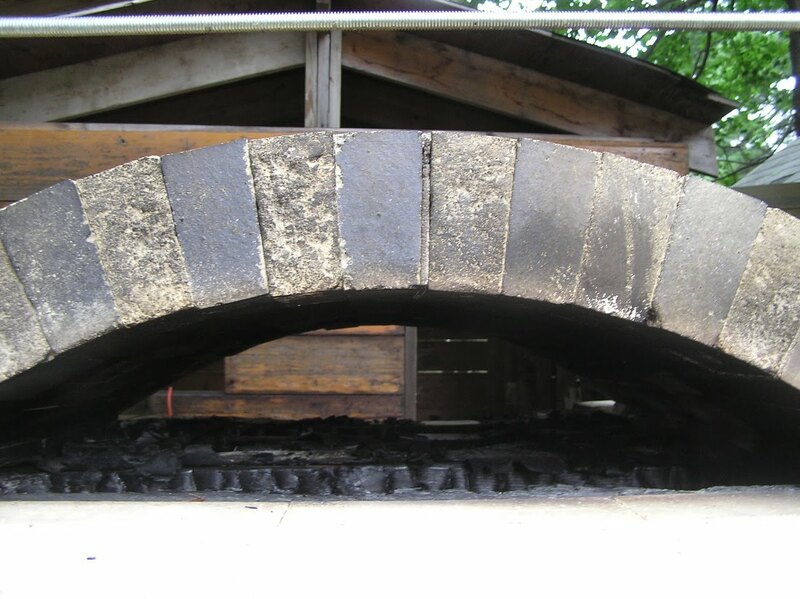 I will be applying the insulating castable directly to the exterior of the arch, so of course there is no way to fire it; therefore Portland Cement is useful is persuading it to set. Portland Cement melts at ^10, however, so I decided to steer clear of any hot-face recipe that contains it. ( I know, I know -- lots of highfire claybodies contain material that fluxes at ^10, it all depends on the proportion, blah, blah, blah. I guess I just don't trust it. Plaster has never been my friend in the studio.) I am leaning towards the recipe which is heaviest on the crushed firebrick, for my insulating layer, mostly because I have a whole boatload of rubble softbrick, and it seems a shame to waste it. I just have to pulverize it. Applying castable will also be a learning experience for me. Specifically I am wondering how long it will stay workable. Should I rent a small concrete mixer to keep it from setting? Or mix up small batches, only as much as I can apply before the set time. What is the set time, anyway? If you have the answers to these or any of life's persistent questions, shoot me an email at castable@finemesspottery.com , or reply in the comments. It takes a village to raise a kiln. Burn it out? Or slide it out? Burn it? Or slide it? Burn or slide? These are the things I spend my hours wondering. 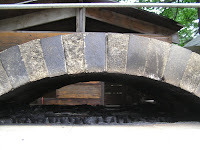 How best to remove the arch form, now that the brick are in place. Burning is more fun by miles, but sliding is more practical, as someday I will need to rebuild the arch, and when that day comes, it would be nice to still have the form. So I'm sliding, if I can. It will still be necessary to burn out the frame holding up the form, so I get a little of both. Here goes! Uh-oh. 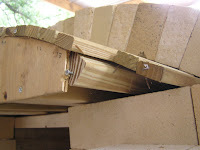 Damn that quarter-inch plywood! Damn my cheapskate nature.So, the form will not survive anyway, which means Plan B is activated: Burn that baby out! If you live in town, as I do, inform the fire department and your neighbors what is going on. There is going to be a world o' smoke. 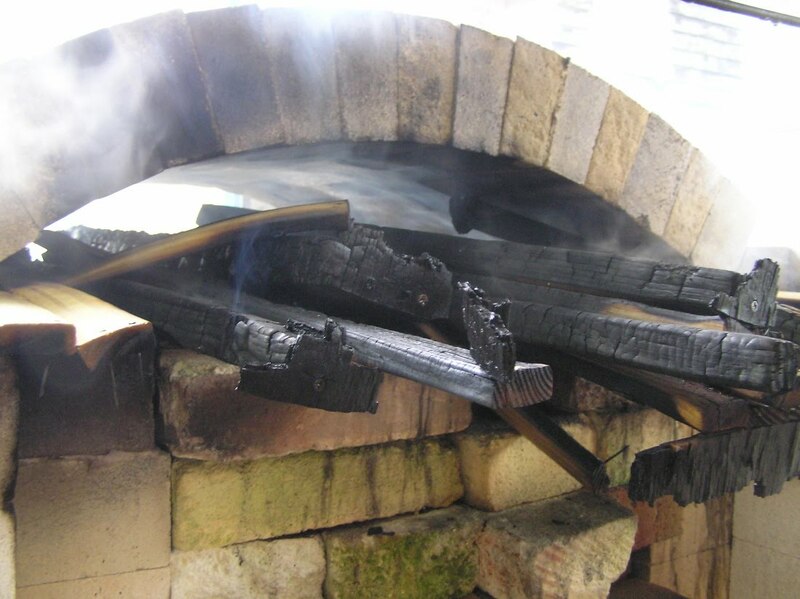 We've had a crazy dry summer, so I hosed off evrything near the kiln, including the beams of the roof over it. The tongue of flame jetting out of the front opening would have licked the shed roof five feet above it if I had not been there damping it back with the hose. I only burned enough to remove the actual arch form. The support that was holding it at the proper height is (obvs) very charred, but I will remove it by hand, becuase of the whole out-of-control smoke and flame thing. A half-brick that had not even seemed loose when I was building dropped precipitously when I slid the form forward. I propped it up until the brick around it could sink the fraction of an inch I knew would occur when the form was no longer holding them up. Once the other brick sank and pressed against it, my woould-be dropsy brick was pinned in place. Next on the to-do list: castable.